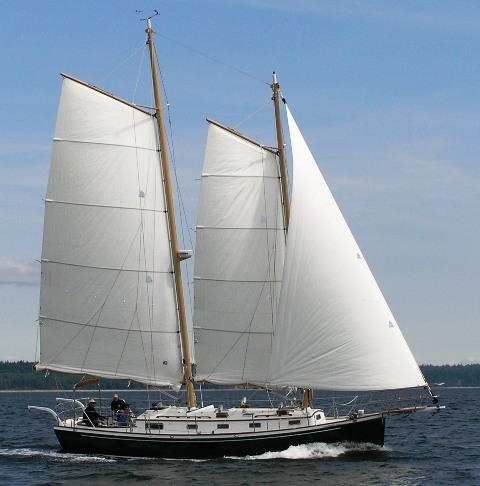 This website is about the design and construction of a 40'6" (LOD) gaff-rigged schooner named "Jakatan" The schooner was designed by Bob Perry and built by Jespersen Boat Builders in Sidney, British Columbia, Canada. The boat was completed in August 2007 after two years of construction. There are many websites that chronicle the sailing adventures of a particular boat, this isn't one of them. This site is about the design and construction of a custom schooner. It may be interesting to anyone curious about designing and building a custom cruising sailboat. It may be particularly relevant to those interested in schooners, gaff-rigged boats, and cold molded wood construction. Although built of wood with a gaff schooner sailplan, Jakatan is modern in many ways. It has a modern underwater profile, carbon fiber spars, a single halyard system for the main and fore sails, easy to use running rigging, and an accomodation plan and interior that can match modern boats for comfort and dockside appeal. The goal was to create a modern schooner with classic design elements that was as easy to sail as production sailboats of similar length. The links on the left of this page will take you to photo galleries with captions explaining everything from why you might want a schooner, to working with the architect, to how the boat was constructed..
Jakatan was designed for the windy waters of San Francisco Bay, its home port. The name of the boat is derived from the names of my wife and two daughters, Janet, Kate, and Anne. Nineteenth century lore also said it was good luck to name a boat with seven letters and three A's so you see more than a few boats with that combination. I hope you enjoy this chronicle of the creation of Jakatan. If you have any questions or suggestions contact me at svJakatan @ gmail.com.